Comment: The staff at MnGeo has done a superb job putting this system in place and then improving it over time. 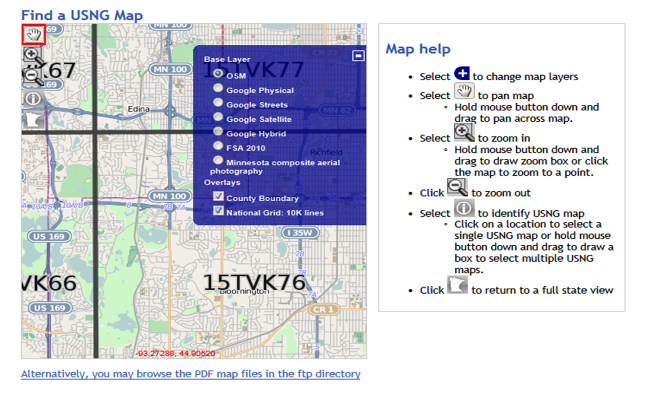 With nothing more than Internet access a user can visually search for an area where he/she needs a map, and then by putting the mouse cursor over that spot and left clicking a second window will open that displays the map's name and allows download. Done! Max kudos to the MnGeo staff for developing this approach that makes these overview response maps easily available for the entire state, whenever they are needed!